Whether you need to train a few individuals, can’t schedule your staff to attend a single on-site training session, or simply don’t have the facilities to conduct on-site training, our Open Enrollment training may be your solution. 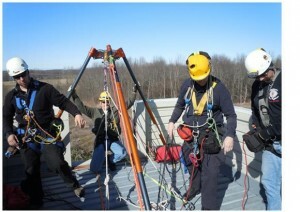 With training facilities in Baldwinsville, New York and Tempe, Arizona, you may find that sending your employees to one of our training facilities to participate in one of our open enrollment training classes is a convenient and cost effective solution for your health, safety, and emergency response training needs. All of our instructors are experienced and dynamic in their training and all of our classes are developed by us to ensure they are applicable to the needs of the trainees, interactive and engaging, and meet all regulatory requirements. Having been in the business of providing OSHA compliant training since 1993, we understand what is needed both in training content and documentation to ensure OSHA compliance. When we began offering open enrollment training, we had to be sure that our training met the same rigorous standards we set for ourselves in our on-site training. As such, we ensure all attendees receive their employer-specific information when required by regulatory standards as part of the training provided this information is made available to us. If such information is not available or cannot be obtained at the time of the training, we will provide those attendees with a “checklist” of training and/or information items that must be provided by the employer following the training to ensure full OSHA compliance. Additionally, in order to ensure you have adequate documentation to satisfy regulatory agencies, we provide a training outline and competency evaluation in addition to the Certificate of Completion for all trainees. We have also tailored several of our classes to be specific for certain industries to better serve those clients. We believe our 19+ years of experience in providing training on-site that is tailored to each client and our commitment to ensuring the same approach to training content, trainee-specific components, and training documentation in our open enrollment training, is what separates our open enrollment training from our competitors.